Originally Nintendo’s mascot before being displaced by the red-suited plumber we know and love as Mario, Donkey Kong is still an iconic character in his own right and has transitioned from Mario rival to part of the gang. But that doesn’t mean we actually “know” Donkey Kong – in fact, most modern gamers won’t really recall his life prior to Donkey Kong Country for the SNES. Yet there are a few interesting tidbits about our favorite ape that we’ve gleaned from the Internet. In this article we’re going to share five things we think you might not have known about Donkey Kong. We promise not to cover the basics, but rather the obscure – you know, the kinds of stuff that would be useful at a Nintendo trivia night. Okay, so we have to qualify this fact with a little bit of popular culture history. In the 1990s, though not brand new in any way, rap or hip hop really took off as a mainstream music genre. Everyone was rapping and everything was a rap. This was the era that gave us Eminem, Jay-Z, and others for one thing. Donkey Kong was not immune to this trend and actually engaged in a rap battle with his enemy King K. Rool. Well, it was a bit one-sided and it occurred during the Donkey Kong Country television show but it counts nonetheless. We didn’t even know there was a Donkey Kong Country show until we learned this factoid so consider this one a twofer. This a long story and actually integral to Nintendo lore in general so we’ll try to give you a brief overview of the salient points. First off, the big pink puff known as Kirby got his name from a Nintendo lawyer named John Kirby. John Kirby successfully represented the Big N in its copyright infringement case with Universal Studios regarding Donkey Kong. The studio alleged that Donkey Kong violated their copyright for King Kong, the classic film. The ruling one way or the other would have a huge impact on Nintendo. Not only was Donkey Kong a sensation in the arcades but it was printing money for the company. Losing this case would have been huge for Nintendo. Thanks to John Kirby, they didn’t, and his name lives on in one of Nintendo’s most popular mascots. This probably comes as a bit of a shock. One reason you never see the original arcade version of Donkey Kong on any of Nintendo’s emulation services is because a different company, Ikegami Tsushinki, owns the rights to the original arcade game. This means that “retro” versions of the title you have played in the past are probably just ports from either the NES or other consoles. And Ikegami Tsushinki is zealous in their protection of their rights: The company won’t hesitate to take Nintendo to court if the company attempts to put the original arcade version of the game out there. Why this is the case is due to a fluke of history. Not as heavy in video games as it is now, Nintendo’s initial effort in the arcade space, Radar Scope, didn’t do as well as planned. Ikegami Tsushinki was the company commissioned by Nintendo to convert the Radar Scope cabinets to Donkey Kong arcade game boxes. Somehow during this process, Ikegami Tsushinki came to own the original source code for the arcade game. Crazy, eh? 2. 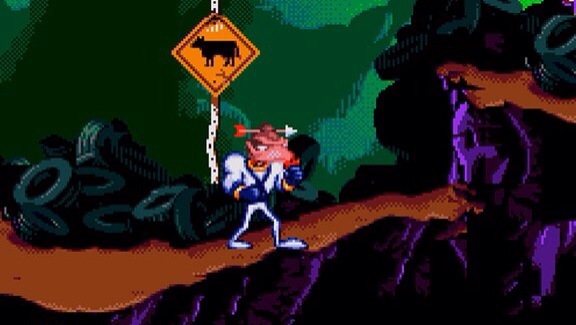 Rivalry with Earthworm Jim? Apparently the creators of the zany and wildly creative Earthworm Jim did not like Donkey Kong Country and felt that it was a bit overhyped. To show their contempt for Rare’s masterpiece the Sega CD version of Earthworm Jim contains an unlockable secret that turns Earthworm Jim’s head into Donkey Kong’s but with an arrow shot through it – a less than subtle message. While common now, voices in games back in the day sounded rough and tended to take up a lot of memory. There were apparently voices set up for Pauline in the original arcade game but, because it didn’t sound that good, Shigeru Miyamoto exed that out of the final product. WATCH – The Original GameBoy TV Commercial Is Amazing!